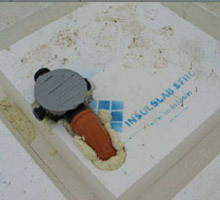 Service penetrations can easily be accommodated by the Insulslab system. These can be located within the beams, ribs or pods (Photo 1). 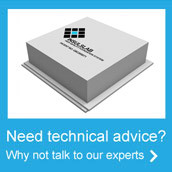 Service holes over 250mm square would need to be checked by a Chartered Structural Engineer. Back to back service penetrations at party wall locations through a beam strip are acceptable provided that nominal 110mm diameter pipe work is used. Service holes greater than 600x600mm would need some additional reinforcement to be specified by an independent Chartered Structural Engineer. Penetrations should be wrapped by isolation joint material to allow for smaller movements and concrete shrinkage (Photo 2). 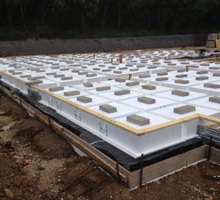 It is possible to install under-floor heating within the construction without the need for additional screeds or insulation. 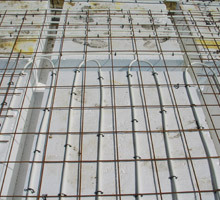 Either a layer of A142 fabric can be installed over the Insulslab pods for the practical fixing of the heater coils or the coils can be connected directly to the pods (Photo 3). The SFRC is then mixed, poured and finished in the same manner as described in Step 5.